Motivation is a must if you are going to be successful in your debt reduction journey. In addition to getting the right program that works for your lifestyle you have to find ways to stay motivated so you see yourself through to your realistic goal that you have set for yourself. Debt Motivator 1: In order to keep your focus on your desire to drop debt make a list of all the reasons why you want to get rid of your debt. Keep it is plain site, tape it to your mirror in your bathroom and read them each morning when you wake up. If you are shopping often, tape to your wallet for a quick view before you buy something. Tape it to your steering wheel or visor. Debt Motivator 2: If you are looking to reduce a lot of debt such as 10,000 dollars. Break out your calendar and set your goals. Be very realistic here. 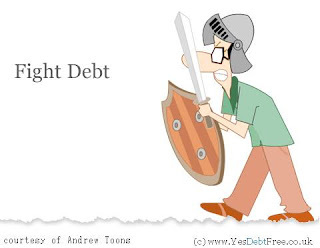 Example your current debt load is 35,000 dollars and your ultimate goal is to only owe on a house or car. Let's say it is January 1st set your first goal of 1500 dollars then realistically plan for that and give it a date. Say March 5th (this will give you 9 weeks to find 1500 dollars to bring in). Set shorter lower mile stones at first to give you momentum then spread it out a little as you go. Debt Motivator 4: Take a screen shot/picture of your debt load and on each month after that take another screen shot of the debt, doing this will make you feel great seeing how the debt decreases each month. Debt Motivator 5: Read inspirational stories of other people who have reduced their debt. Don't just read how they did it but also read about their success for what it is, success. Every person is different so the plan that someone follows doesn't mean it will work for anyone but them. Keep the lines of communication open so that you can inspire, congratulate and help pick each other up through the good and the bad times. I'm always appreciative of another good tip. Debt motivator # 5 is the most effective for me. It is really nice to read other people's debt stories and it makes me feel that I'm not alone struggling to pay my debt. There are other people too and if I'm in the midst of financial chaos, well, there are others too! :) It somehow transform into motivation for me. Debt reduction a fantastic fantasy. In this day and age with many of us out of work or 'under employed'. HOwever there are a few tricks ...to help you find some extra cash. 1) Pare down snd sell some of your overage...who needs all that stuff anyway. 2) Take in a border ....think of it as a service you are proviiding for them as well as yourself. it's visual and helps you get where you want to be, eventually. it’s a good proposition for debtors. And once you get yourself free from debts, make proper planning in future and handle your financial matters intelligently and logically. I have spent the last two years trying to pay down debt. Easy to create, hell of a difficult to shift. Great tips. Motivation is an extremely important thing in dealing with the debt. To my opinion, debt-free life should be the main motivator, when you aren't nervous and can sleep at night normally. I think one big goal consists of smaller ones, and it's importnat to set right goals and create a plan which will work for you personally. Treating yourself is also important, when you see first results you should thank yourself and get a motivation for further actions. Debt elimination is a difficult process and takes time,but be patient and think that with each day you become closer and closer to your finanal goal.